Happy Halloween! To celebrate… more pumpkin!!! A year ago my aunt, Sharon, told Mom and me about this amazing recipe she made. It sounded delightful, but stuffing a pumpkin sounds kind of hard, so we didn’t ever get around to making it until now. And as I text Sharon, I kind of hate myself for waiting a whole year. This is amazing. Like holy YUM amazing. I HIGHLY recommend you celebrate Halloween with one of these stuffed pumpkins. Or if you don’t have a strict menu of timeless family favorites that you absolutely must make at Thanksgiving (like us), this would be a wonderfully lovely addition to your Thanksgiving table. It’s vegetarian, so you can carve it instead of a turkey if you swing that way. Just don’t wait a year. I’m not sure I’ll be able to wait a week before making this again. I picked up the cheese for this at Whole Foods, they have a bin of oddly shaped bits of cheese, so I was able to pick up Gruyere and Blue Cheese in just the right amount. Then again having “leftover” cheese is never a problem in my mind. Preheat oven to 350°F. Line a baking sheet with parchment paper, or use a Dutch oven that’s the same diameter as your pumpkin (although your pumpkin will stick and you’ll have to scoop it out instead of cut into it). Using a sturdy knife, carefully cut a cap off the top of the pumpkin. Scoop out the seeds and stringy bits (just like carving a pumpkin). Season the inside with salt and pepper and place on baking sheet or Dutch oven. 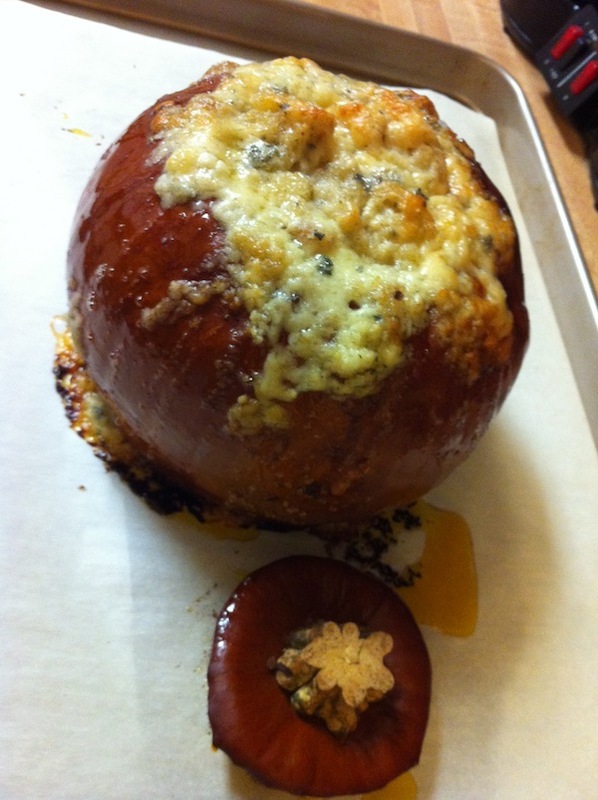 Stuff the pumpkin in layers, starting with the bread cubes, then garlic, then cheese. Repeat until the pumpkin is filled. Mix together cream, nutmeg, salt and pepper. Pour mixture into the pumpkin. 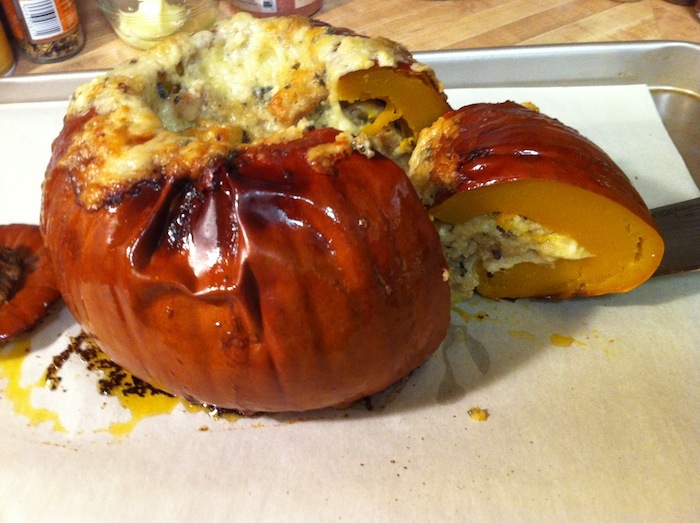 Adjust ingredients as needed, you want the pumpkin to be filled and just moistened by the cream mixture. Put the cap back in place and bake for about 2 hours, check after the first 90 minutes, everything inside is bubbly and the outside is tender enough to be pierced with a sharp knife. Remove the cap for the last 20 minutes so the top can brown. Cut the pumpkin into slices and serve.